Hi, tell us who you are and what lead you into microservices? 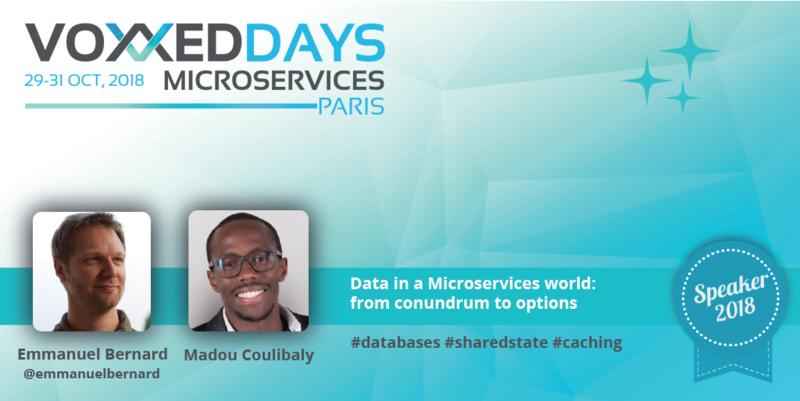 Hi, I’m Emmanuel Bernard, Hibernate contributor, Java Champion and Chief Architect, Data at Red Hat middleware. I’ve always been involved in improving how to process data from within applications. With microservices, the challenge is more complex because it involves inter system data communication. Even more fun. Hello, my name is Madou Coulibaly and I am a EMEA Specialist Solution Architect at Red Hat since 2016 with a strong focus on Data. With 8+ years experience in Data & information management (BI, DW, Big Data, …), I am now working with customers across EMEA for providing expertise, guidance and knowledge about these Data products. Microservices is a new journey Data has to embark on with the big challenge to “live” in a distributed and complex environment. So to help it, Data brings me into this new adventure. Patterns on how you organize and make your Microservices communicate to best benefit this architecture style is starting to emerge. But one subject that is often left behind is how to deal with data in such architecture. Frankly it is not easy and likely one of the toughest topics around Microservices. When talking about microservices, we first focus on wiring, network failure, availability, scalability… and we tend to forget about modeling or data. Is your talk about the end of the monolith database? Well, yes if you start afresh with a brand new application and brand new data. But we have seen many many people building new Microservices around their existing applications. We call that Greenfield Microservices off a brownfield database. In that situation, the monolith database is here to stay at least during the transition phase were the monolith application is “choked” i.e. replaced by various Microservices. We want to show that there is a relatively smooth transition plan which is compatible with trial and errors. Definitely, we are excited and we hope it can turn into a conversation to exchange with the community on their best practices!